Are you fast enough for GT? If you’re an amateur and you think you’re fast on 2 wheels, I suggest you better start training immediately! In April 2009, GT Bicycles will launch a new seven-race cross country series called the GT Golden Bike Series. 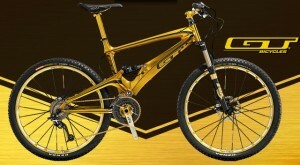 This competition will be unique in the sense that the winner of each stage will receive a Golden Bike. However, there is one catch – the winner must defend his title by racing it at the next event in the series or they will forfeit the prize package worth more than $10,000! Basically, the only way that a cyclist can retain the Golden Bike is by completely obliterating the opposition. Otherwise, say goodbye to your bike and go cry over spilt oil. The competition also allows the winner of each stage an all-expense-paid trip for 2 to the next race, a bag full of goodies, a commemorative GT Golden Bike, a professional bike mechanic and a personal cheerleading squad (“The Gold Diggers”). Just remember that this series is only available to amateurs! So if you’re a professional cyclist, get lost!